First off, I completely agree with NO NINTENDO EVENTS! I'm never going to find the time! And it's unfair because I'll never completely finish the game without a complete Pokedex! Second, I would like all the regions in this game. However starting off in Kanto. Third, as in the Yellow version you not only got Pikachu, but the other 3 starters also. Something along the lines. it would be nice to see other types of pokemon. and its always fun to encounter suprises too. <font color=ACEACE>Side quests, lots and lots and lots, or side quests. More side quests than FFX-2, and that had a lot of side-quests. It just makes to game last longer, and if it is a mini-game or something similar, much more fun. -For example, Final Fantasy X has one and the battles are a lot more balanced. -Give the underdeveloped types like Rock and Bug decent moves. -Give weak one-off Pokemon like Farfetch'd, Dunsparce and Luvdisc evolutions. -Have every Pokemon serve an actual purpose. Try to have more gripping side quests. That for sure and the same goes to Steel types. How about missions where you have to use your pokemon moves to complete your side missions. Pokemon/Sims game... hmmmm that would be novel to say the least. What if you could become a Gym Leader yourself, and trainers came to challenge you? although for the same reason, it can make for some potentially broken pokemon. with EVs and nature in favor of evasion, something'll be able to dodge a lot more than you'd want it to... I do agree that accuracy needs to ne tinkered with, though. I'd prefer missing/evasion to be part of the game, not a match-saving stroke of luck. <font color=ACEACE>Maybe if instead of a "Speed" stat there is an "Agility" stat, which folds in Speed, Evasion, and Accuracy, like FFX, though Accuracy doesn't need to be there. It would be alright since speed and evasion are kind of the same thing. I'd like to see another Type: Abnormal. Since people want Dark to have "Light" and all...Abnormal Types could be mutants, and very hideous. Also, who else would like to see more types of Weather: like Snow [Ice], or Fog [Poison]? Along with "Seasonal" Weather, should a Calendar be implemented. I like this idea...reminds me quite a bit of Animal Crossing's "Delivery" system. Your Rewards could also be Rare Items! That Idea is potentially Game-Breaking...maybe you could limit it to Moves they could only learn through Breeding Chains anyway? I would REALLY love having a character deisgn system in future gameboy games. You could make it boy or girl, change color of hair/skin, and mix clothing for a dream outfit. Cool Nickname, by the way. Eyes and Age of character wouldn't be included, since the eyes are too small and the characters in Pokemon never age. What about when you view your Trainer Profile? Also, there's going to be a distinct difference between an 11 year-old's Sprite & a 19 year-old's Sprite. If the Day/Night system doesn't return, I'd like to get through a Sun Stone & through a Moon Stone. I'd also wanna see Vineon: an Eevee Evolved with a Leaf Stone. As for the clothes, I would like to also see things like Umbrellas, Sunglasses and Rain Coats. 3: HM 00, HM 00 will take a move from a pokemon, and you can use it to teach another pokemon. Well HM 00 would be like a TM, It would have the effect of using a TM on a pokemon, so you could teach pokemon that could learn Bite, Crunch. If we left it with the breeding chains, it would be kinda boring. Though ones like Crunch on Mewtwo, Electrode with Spore and stuff like that wouldn't work. I did not mean "Any pokemon can learn any move though this." So in short: It'd sort of like having a TM for every move, though one pokemon loses one move for another pokemon to learn it. Use HM 00 on a Parasect, select Spore, Parasect forgets Spore, now HM 00 is a Spore TM. Though after you use it, it returns to HM 00 without a move. brilliant. when it is sunny, the chance of finding fire pokemon = more likely, foggy = poison and ghost, rainy = water, snow = ice and water, hail = ice, windy = flying, cloudy/dark weather = dark. etc? i dont think that's a good idea because, the 'challengers' would probably come to infrequently and then u'll stand there forever. if someone rings you and says i want to challenge you then u could to bakc to the gym and then challenge them. EDIT: That's a triple post, Ice Master. DO NOT do this in the future, please use the edit function. Your posts have been combined into a single post, and the extra posts will be deleted subsequently. I get it now: HM 00 is essentially a "Move Trader". I'd also like to see more than 50 TMs...as well as having them be reusable. It's so annoying that we still have to drop them, even though we've now got more than enough room for all of them! More Dragons! I would looove to see more Dragons! Dragons are the Elite type! They dominate! And, I would like to see more often. I looove . 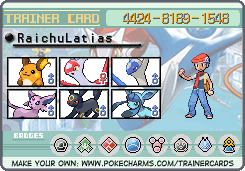 Thanks to the username Articuno, for reliving my looove my ! Just to name a few. Oh yeah, and . half the suggestions will never be implemented... the land of pokemon is supposed top be, liek, eco-friendly, and everyone one with nature.... so why would they add a car? though the idea of going to the darkside is cool... like choosing your destiny, instead of it all preplanned for you, i doubt it'll ever happen. anyhow... I think the touch screen is where all the menues will be TonberryKing. NO... there needs to be a pure flying type... why is it that all the flying types are either Normal/flying or some other combo??? Because a Flying monoType might actually be good? 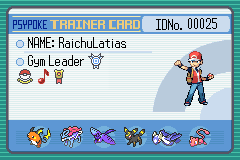 I'd like to have Multiple Rivals this time: maybe one like "Blue" (a serious Trainer who can actually battle), a "Generation #3" (opposite-gendered, friendly competitor that gives you Items and like) and maybe a Thief.